I suspect I have somewhat of an unusual perspective in the board game world, being a reviewer but still feeling somewhat outside of the board game media community, so this might be completely off the mark, but I feel like the board game world right now is really focused on novelty and flash. I’m not saying this is necessarily a bad thing–I have been long clamoring for more innovation. But when you look at Kickstarter you see minis on top of minis. When you look at “most anticipated” lists you see, besides some notable designers, a lot of high concept ideas. What room is there for the kind of game that’s simply fun? A while ago I would have said that I was tired of such a thing–I have enough simple, fun games. Give me something new! Right now I’m of just about the opposite mind. The hunt for innovation is difficult and frequently disappointing. It’s often a thematic race to the bottom of more ridiculous flash and more ridiculous concepts. 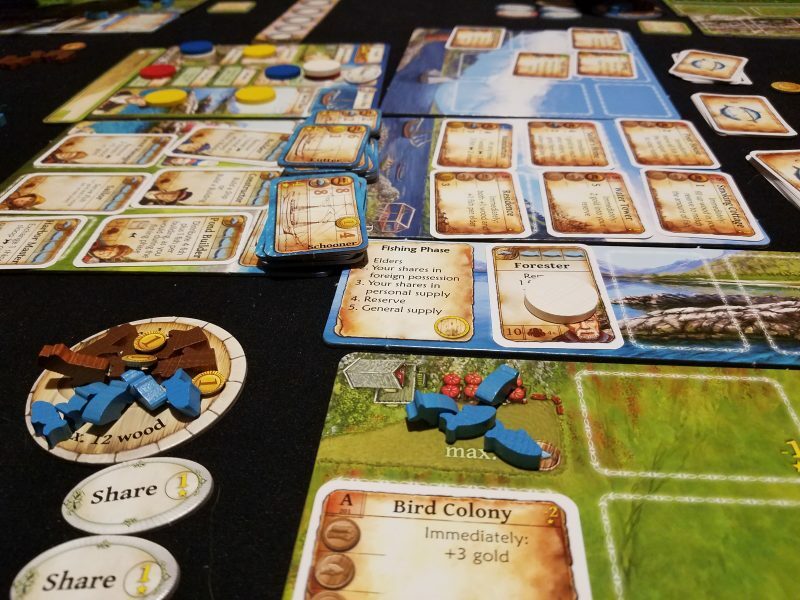 Enter Nusfjord, a game so unassuming and modest that it even sort of slipped through the cracks among Uwe Rosenburg’s designs, between the mammoth A Feast For Odin and whatever Patchwork variant came out around that time. Even for Uwe, the man known for games about farming, Nusfjord seemed sort of…quaint. It is quaint, frankly. 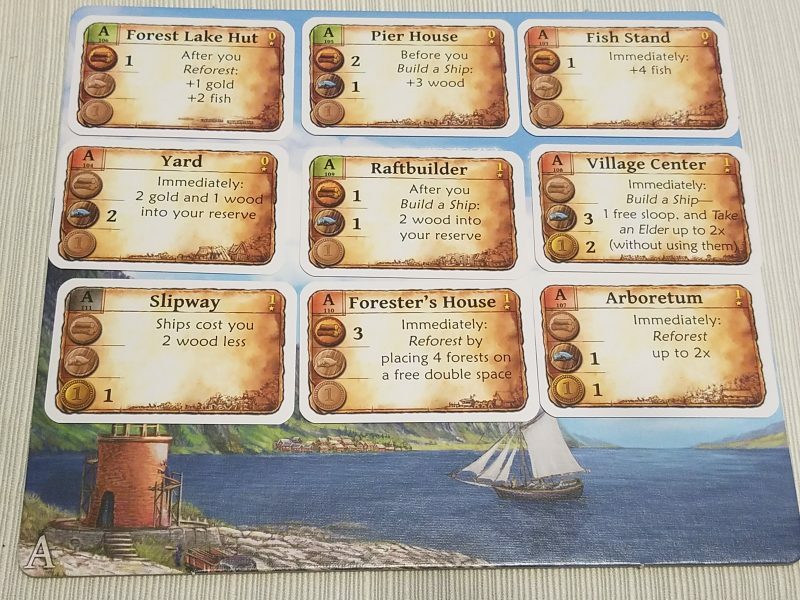 Each player is in charge of building up a fishing enterprise in the Nordic village of Nusfjord. You’ll be placing workers (of course) in order to upgrade your ships, build buildings, harvest forests, and…wait! Don’t go away! Was that a yawn I saw? I’m telling you, this game is fun. The fun orbits two very nice mechanisms. First, there’s a banquet table around which the village elders sit. You’re going to want to enlist their help to grow your business, and they’re going to want fish. Lots of fish. The tricky part is that this banquet table is communal. Whenever you recruit a new elder or use the services of one of the elders you’ve already got under your influence, you remove a fish from that table. If there aren’t any fish there, you can no longer use any elders. But, if you’ve got a bounty of fish, you can sell them to the banquet table for delicious cash money. Money is also victory points, so this is lucrative. What you end up with is a seesaw of building up and cashing in–elders are employed generously in order to accelerate your company’s infrastructure, but you want to be able to jump on that fish sale at just the right time to maximize your profit. It’s tense and interactive and gives you good options no matter what your opponents do. 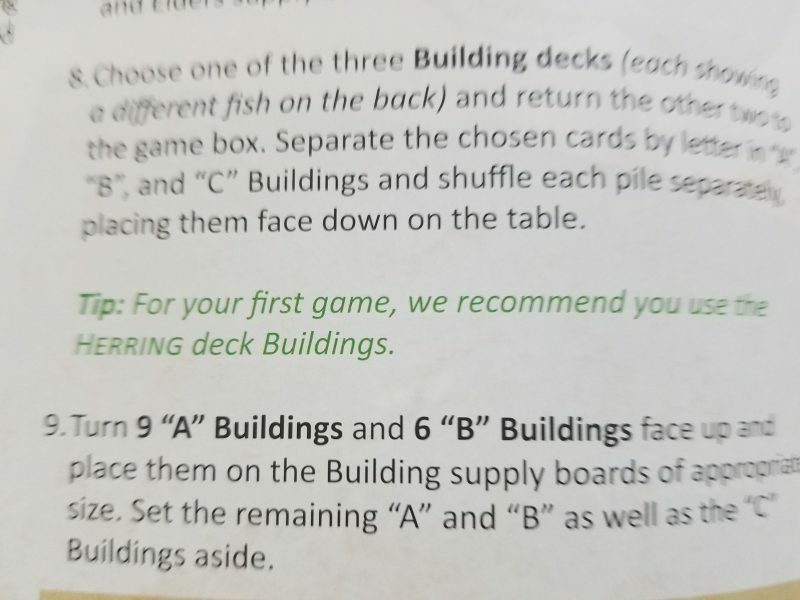 The second primary delight of Nusfjord are the building cards, which are randomly selected before the game from three different decks. They provide a tantalizing selection of both short and long term benefits–from marginal efficiency boosts to bonuses around which you can plan your whole strategy. The variation is wonderful, and each deck seems to have a different emphasis. A game of Nusfjord is as much trying to navigate through this selection as anything else, and I find myself quietly pondering the possibility space they open up much like I would when seeing a Dominion kingdom pile for the first time. The strategic serenity present in the beginning of a game of Nusfjord is echoed by the artwork, which depicts a truly beautiful landscape full of sea-swept grasslands and crisp blue waters. I want to live there. Can I move there? I like fish, and if the game is any indication there’s plenty to go around. 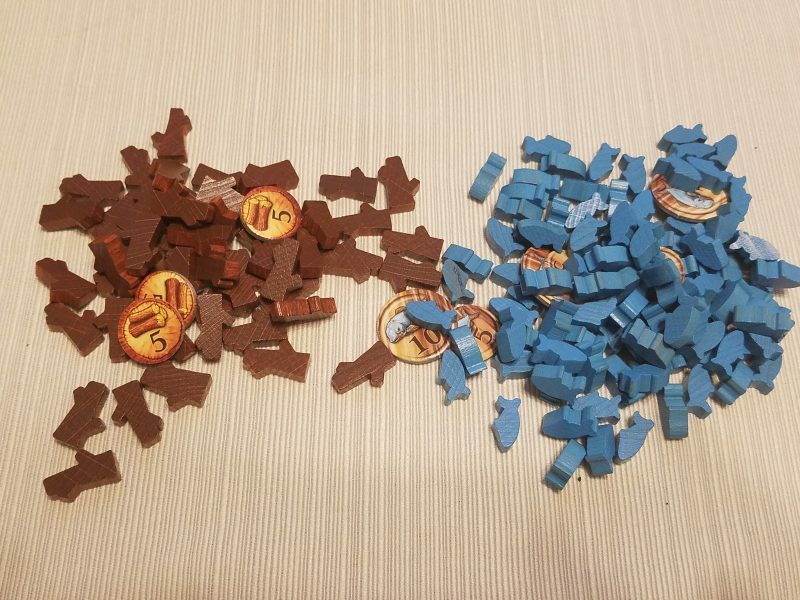 No joke, you’re going to be collecting dozens of fish and/or wood, piles of tokens overflowing your modest supply board. This isn’t Agricola-Uwe, but some kind of resource penance. Everywhere you go in Nusfjord you trip over fish. That doesn’t mean that there isn’t any tension, but the kind of tension Nusfjord has is centered around trying to get the best of many different good options. Opponents will definitely be blocking spaces, taking the cards you want, and otherwise mucking up your plans, but the worst punishment you’ll receive is a couple fewer victory points rather than the starvation of your children. I can hear off in the distance, and have seen on social media, the cries from veteran eurogamers that we’ve seen all of this before. I won’t deny it. We have seen all of this before. Maybe you’re done with it, but I’ve found that I’m not. It’s so nice to sit down to a game and find that you’re in the sure hands of a veteran designer who knows how to make something with mechanical polish and thoughtfulness. It’s nice to be presented with a number of pleasant options rather than excruciating dilemmas. There’s an old school charm to opening up a box and seeing a pile of cardboard, wood, and little baggies. That’s not to say the game is perfect. Sometimes the banquet table of good decisions you’re presented with drift into decisions that all look the same, VP-wise. There’s a reserve system where some of your resources go on occasion that you have to spend an action to access. While it does fuel some interesting building card interactions it doesn’t feel fully fleshed out. I don’t have many complaints. Nusfjord has an assurance, a confidence that you’re going to have a fun time without spending a lot of time doing it. Yes there are more exciting games out there on the surface, but Nusfjord contains an excitement of the mind. As you look at the building display, weighing your options and trying to chart a path to fishing mastery, you’ll start to feel the chill of the sea wind. Deep down, in that puzzle solving, engine building part of your mind, you’ll be thrilled.